Click this icon to download the first 72 pages of this book. Captain Llewellyn (“Lew”) Jenkins had a problem. A dozen Nazi SS Troopers had just escaped through Russian-controlled territory in Czechoslovakia and surrendered to his American soldiers. World War II in Europe had just ended. Lew received word that he was to return to the Russians any German soldiers coming from Russian-controlled territory. Lew had done that the day before, when another dozen SS Troopers had surrendered to his troops. But the Russians executed them. Comply with orders, or save the lives of a dozen men who, just weeks before, had been trying to kill him? Decades later, Lew, now a top executive in the third largest commercial bank in the United States and President of the powerful American Bankers Association, was summoned to the White House. The prime interest rate that banks charge to their best customers was nearly 21 percent. Some people were blaming President Ronald Reagan for the high rates. His staff was looking for a scapegoat. Bankers were easy targets. No one loves a banker. Lew Jenkins, who is 94 and still going strong, is living proof that Brokaw was right. 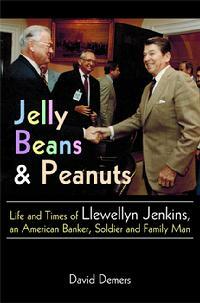 Cover Photo: Lew greets President Reagan during a bill-signing ceremony in 1981. About the Biographer: David Demers, Ph.D., worked as a newspaper reporter, market research analyst and professor for more than three decades before devoting full time to writing and editing. He is author of more than 15 books and scores of journal articles and book chapters. He lives in Phoenix.